Orthokeratology (Ortho K) is a non-surgical procedure that eliminates the need for glasses or daytime contact lenses. 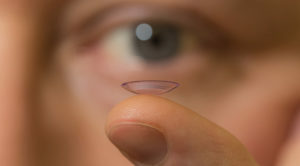 It improves vision by gently reshaping your eye while you sleep using specially designed gas permeable contact lenses. You just put the specially fitted lenses in at bedtime, and when you awake, you will have clear, sharp vision. This safe and effective treatment can correct near-sightedness and farsightedness in most cases. Ortho K contact lenses flatten your cornea without surgery, enabling light to focus properly on your retina, resulting in better vision. It is a great alternative to LASIK (laser vision correction) for those who don’t want the risk or are not ready for surgery. The Ortho K lens redistributes the superficial cells of the corneal epithelium to flatten the central corneal shape, allowing light that once focused in front of the retina to now focus on the retina. The lenses are worn at night during sleep, and are removed upon awakening. Most patients start seeing results within the first few days of treatment and achieve their optimum vision in 10 to 14 days. However, the length of time for Ortho K to work depends on your initial refractive error, corneal shape and corneal tissue. Stable vision throughout the day is usually achieved after 1-2 months. However, it is not a permanent change, so if you stop wearing the lenses, your eyes will go back to their original shape and refractive error. You will need to continue to wear the lenses as long as you wish to maintain the effect. Each patient is required to have a comprehensive eye health examination. If your prescription falls within a certain range, further testing will be done. An extensive computerized corneal mapping (Corneal Topography) will help determine if you are a good candidate for this procedure. If you are a good candidate, your contact lenses will be custom ordered to your specifications. You will be taught how to insert and remove the lenses and care for them. After the initial dispensing visit you will return for several follow up visits to monitor your progress. The risks of Ortho K are minimal and are similar to those of any gas permeable contact lens – corneal distortion, dry eye, mild abrasions, etc. All potential complications are minimized with strict adherence to proper wearing schedules and lens maintenance. There are no serious adverse events reported in the FDA study. I suffer from “dry” eyes, could I benefit from Ortho K? Yes. Many patients with slightly dry eyes do well with Ortho K. Since you are wearing the lenses only while sleeping, the closed eye state minimizes evaporation loss of tears and can give dry-eye patients improved vision without compromising the ocular surface. Many dry eye patients are more comfortable during their waking hours with Ortho K versus soft or gas permeable contact lenses. I used to wear contact lenses, but stopped because of discomfort. Am I a candidate for Ortho K? Ortho K lenses are worn at night while you are sleeping so this greatly reduces any discomfort normally experienced while wearing contact lenses during the day. Can I see with my Orthokeratology lenses in? Yes. One of the great features of the Ortho K lens is that you can get up in the middle of the night and be able to see perfectly. You will enjoy great vision with your Ortho K lenses on or off. No age limitations! Great results for patients of all ages. Ortho K lenses are custom designed for your eyes. Non-invasive procedure that is completely reversible. Great non-surgical alternative to LASIK. Alternative for people who suffer from seasonal allergies, play sports or enjoy water activities that make wearing contact lenses during the day a hassle.